For those who thought that the Ansmann Starlight Ladybird was a bit too girly for their baby boy, Ansmann are prepared and are not without a solution: Introducing the Ansmann Starlight Turtle Lullaby. The Ansmann Starlight Turtle Lullaby is the perfect present for any baby or young child no matter what gender. Projecting stars and a moon on the sky, the Starlight Turtle helps to calm and relax your young ones before they fall asleep. This is not only essential for a good night’s sleep but because the Starlight Turtle is efficient too it saves you money on batteries. This is because after 45 minutes of being powered on, it automatically turns itself off, meaning the batteries don’t drain but it does so in more than enough time for your baby (or yourself, we won’t tell!) to fall asleep. Lights on the Starlight Turtle have four possible modes. Using the touch sensitive back of the Starlight you can alternate between green, yellow and blue glows of light, or put it onto a final mode which alternates between the three, pressing the button after this setting will switch the Starlight off. As previously mentioned, the Starlight Turtle is mainly for boys however the Starlight is unisex and would be just as nice of a gift for a girl. 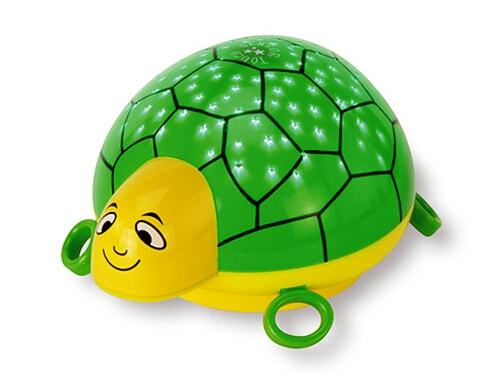 This model of the Starlight Turtle is the lullaby version which means that a soft gentle lullaby is played when it’s on to help you and your kids drift off. The Starlight Turtle uses four AA batteries which are required for use and Ansmann have included these in the box for ease of use. 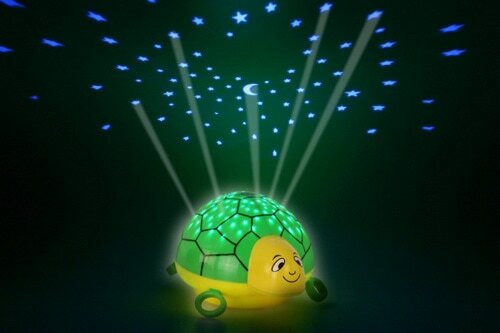 You can currently grab a Lullaby Starlight Turtle for the amazing price of £18.00 inc VAT! So look no further for a gift for the birth of your friend’s or relative’s baby, as you have found it with the Starlight Turtle, a superb baby product by Ansmann.